It’s that time of the year when the major toy companies start leaking news about their new products in advance of the New York International Toy Fair, which begins in less than two weeks. 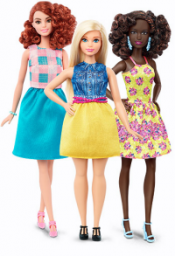 The big story making the rounds this week is that Mattel will be introducing three new body types for their iconic fashion doll, Barbie. 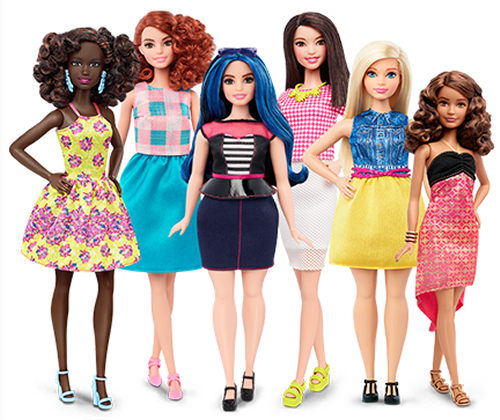 Introducing the 2016 Barbie® Fashionistas™ Dolls. Releasing over time throughout the year, the line includes 4 body types, 7 skin tones, 22 eye colors, 24 hairstyles, and countless on-trend fashions and accessories. It’s a big deal as Mattel will produce Barbie in three new body types that may eventually be sold alongside their traditional doll. There will be a “Curvy” body, shorter with a larger bust and wider hips. The “Tall” body is lanky and slim. The “Petite” body will be shorter than the others. Their aim is to make Barbie more relatable for the next generation of girls. These dolls will be produced with a wide range of skin tones and diverse facial sculpts and hair styles. This is terrific news for parents who don’t want their daughters forced to play with dolls that have an idealized and narrowly defined standard of beauty. However, this is not great news for our friends in Pittsburgh who make the Lammily doll. You may remember when we wrote about Lammily, a fashion doll designed with realistic body proportions. Lammily is a small company and this new move from Mattel could severely damage their business prospects. Lest you think that this is some new kind of dirty tactic on Mattel’s part, let me reassure you Mattel has been doing this for decades. For the time being these new Barbie dolls with different body types are only available from Mattel’s website, but they sell for less than half of the retail price for Lammily. In 2014, Lammily launched the world’s first realistically proportioned fashion doll with the help of over 13,000 backers. At that time, some of the biggest toy companies were not sure if kids would actually want a realistic doll. Lammily is thrilled that Mattel has released Barbie in different body types. To us, it validates what we’ve been doing for the past several years. The “realistic fashion doll” market is now a very real thing and Lammily is excited to continue to innovate in this field. We can’t wait to show you what’s next! One of the risks of trying to bring a new fashion doll to the toy market is that if your product shows any potential to achieve commerical success, Mattel will imitate it, rush it into production, and get it on store shelves, possibly before you even have a contract with a factory to manufacture your doll. With many of the top toy factories under contract and already having exisiting relationships with all the major retailers and toy distributors, Mattel can simply sit back and react to any potential new trend and put their considerable marketing might behind it and beat any smaller company to retail. If that doesn’t work, Mattel has an army of lawyers that could turn back the forces of Atilla the Hun. This has been going on for a very long time. Do you remember Jem and the Holograms, Hasbro’s mid-1980’s rock star fashion doll? Did you ever wonder what the inspiration was for Barbie and the Rockers? When Hasbro tried to retaliate by buying the license to produce the British “Sindy” doll and redesigned her to look like Barbie, Mattel responded in court, and the matter was settled with Hasbro backing down and backing away from fashion doll market for years. When Bratz dolls carved out a huge chunk of the fashion doll market share, Mattel attempted to copy their success with Barbie “Flavas,” a line of big headed, skankily-dressed fashion dolls that looked a lot like Bratz. When Flavas failed to catch on with little girls, Mattel resorted to filing a nuisance lawsuit that wound up costing them a quarter-billion dollars in legal fees, but kept Bratz off of store shelves for three years, thus destroying a competitor that was on the verge of outselling Barbie. That quarter-billion dollars probably turned out to be a great investment, because the absence of Bratz in toy stores paved the way for Mattel’s successful introduction of their Monster High line. Late last year, Mattel introduced Made To Move Barbie, a super-articulated fashion doll who could be put into dozens of realistic yoga positions. Parents and even action figure collectors were thrilled. One of the major criticisms of Barbie over the years has been her lack of posability.Collectors were snapping up the dolls as soon as they hit store shelves, and speculators were selling them on eBay for three-times what they paid. This was not welcome news for the folks who make Az-I-Am Girlz, a super-articulated fashion doll who can attain any yoga pose. Mattel’s Made To Move Barbie hit retailers shelves right before Christmas with a price tag of fifteen dollars. If you want a Yoga Doll, you can only find her at the Az-I-Am website and she’ll set you back almost thirty bucks, plus shipping. Now that the Christmas rush has died down, it’s relatively easy to find Made To Move Barbie at her intended price, and that pretty much crowds AZIAM out of the market. The truth is, they probably didn’t feel threatened at all. Mattel is simply content to let small startup toy companies do their research and development and come up with innovative products that Mattel can then appropriate for use in their Barbie line. If these new body-type Barbie dolls are a hit, Mattel will claim that they had been in development since before Lammily ever existed. If they bomb, then they’ll say that it simply proves that girls don’t want realistically-proportioned dolls. Before you think Mattel gets away with murder all the time, just remember what happened last year. 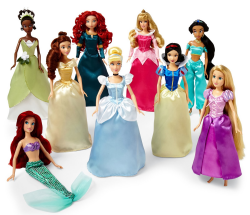 Up until December 31, Mattel had been making the Disney Princesses line, which was a $700 million dollar a year brand. Mattel grew concerned that the Disney Princesses were eating into Barbie’s market share. 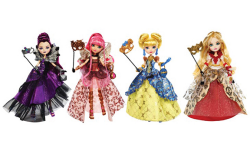 To counteract this, they created Ever After High, a doll line patterned after their own Monster High dolls, that featured characters who were the offspring of public domain fairy tale figures. The problem was, Disney had already created a property based on the same premise called Descendents, and they placed that fashion doll line with Hasbro, just to see how well they could handle a girls toy. Hasbro handles most of the boys toys for Disney’s Star Wars and Marvel properties, but they have traditionally been weak in marketing to girls, especially since the Sindy debacle. When Mattel introduced Ever After High, Disney made the decision not to renew the Disney Princesses license with Mattel and instead handed it off to Hasbro, who took over not only the Disney Princess line, but also the very lucrative Frozen line, on January 1 of this year, making them a major player in girl’s toys overnight. Mattel basically threw away a brand that had generated billions of dollars in favor of their own line, which was only making a fraction of that amount. The result of this was the ouster of Mattel’s CEO and the “resignation” of their Board of Directors. The new CEO called Disney on his first day on the job and apologized so that he could protect all the other Disney licenses that Mattel manufactures (Cars, Planes, some Pixar properties). Mattel doesn’t always come out on top but more often than not, their crafty manipulation of market share is one of the major reasons that Barbie is still a top selling toy more than fifty five years after her introduction. PopCult Toybox note: Your PopCulteer will be traveling to the International Toy Fair in New York City at the end of next week. With all the intense Toy Fair hoopla, we are getting buried under cool and exciting press releases. For the next month, you can expect a whole bunch of bonus PopCult Toybox posts as we gear up for the big extravaganza.